Now YOU are wondering: Am I crazy enough to #Dare2Tutu? We say sure! Why not! Here are three fun ways to participate – with and without the tutu! 1. Just Do It! Buy a tutu and go have some fun! Be creative and share your willingness to get a little crazy in honor of those with breast cancer. Did you know that by buying a tutu for breast cancer awareness at our store, you make a contribution to our foundation?!? Every purchase makes a difference. Want to do more – join our #Dare2Tutu breast cancer campaign as a fundraiser, and become eligible to win some fun prizes. 2. Tell Your Story – Who do you #Dare2Tutu for? Follow this link for a #Dare2TUTU print-at-home template! 3. 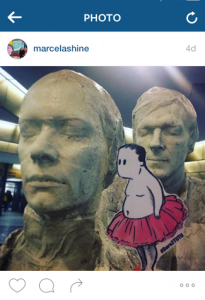 Finally, take “Ballerina Bob” with you everywhere you go! How many places can you take Bob? 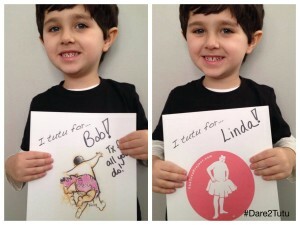 Don’t forget to tag your pictures #Dare2TUTU so that we can share your story with the world! You can find “Ballerina Bob” on the last page of this print-at-home template. Remember that ultimately, we are here to help men and women with breast cancer by funding daily expenses not covered by insurance. Do not forget to donate, and spread the word! Love, love, love this. I stumbled on your project and I am not sure how I found you guys. This is wonderful. I am sharing this with my husband and sister-in-law while on vacation in WI. We want to know if you are selling your snow globes? We would love to purchase some of them. Thank you for the giggles and your work to help beat the strain and struggle cancer brings into our lives. Hi Karen! Thanks for the kind note. The snow globe was a prop for the commercial, but stay tuned because we released new products all the time. We hope you will check out the new t-shirts, calendars and tutus! You can make a donation at http://www.dare2tutu.com to help make a direct difference! When my sister went through her breast cancer journey, it was a time when nobody talked about it, except a few close women in hushed voices. How I wish we had Bob’s exhuberance and your strength to laugh and celebrate life, love and silliness, as it is all silly and we need all our emotions to get through. Bob, you are a true human with great legs. Am sending a donation your way. When does the book come out? I’m wearing your pink tutu with pride today at our Taos Zumba Pink Party. My husband says I look like the hippo in Fantasia. I love it! Vanessa sorry we just saw this comment! We’d love to see your picture! Post it via Facebook to our page and we’ll share it! Thanks for wearing it with pride. Hope you’ll join our #Dare2Tutu campaign in October.